I don’t care how many times you read this opening paragraph. Study it word for word. Examine it frontwards and backwards. 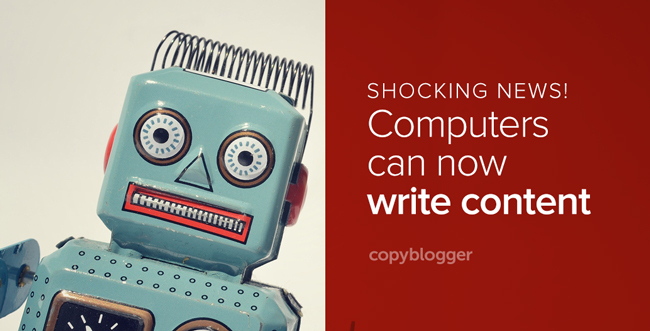 You won’t be able to conclusively tell whether it was written by a human or machine. See, when it comes to a computer-generated story, there aren’t any telltale signs that it’s manufactured by a machine. That’s how good this machine-written content is getting. Perhaps you have heard: machines are taking over the world. Not H.G. Wells-style, with fighting machines equipped with heat rays and “black smoke.” No, this invasion is more prosaic: machines are kicking us out of the cubicle. In fact, according to a 2013 Oxford Martin School study, 47 percent of U.S. jobs are susceptible to machine automation. But this shouldn’t surprise us. Machines have been displacing us for more than a century. During the industrial revolution, machines took away the dirty and dangerous jobs. In the 20th century, machines took away the dull ones. And now they are after jobs that require decision-making. The 21st century has ushered in an era where Natural Language Generation (NLG) machines are making headlines — and yes, that statement has a double meaning. Read Forbes’s earning reports? You are reading machine-generated content created by Narrative Science’s Quill platform. The Associated Press generates more than 3,000 financial reports each quarter using the Wordsmith platform by Automated Insights. NLGs are also creating product reviews and economic studies. Machines might be behind the content in many places where you find a massive, complex, and confusing amount of data that needs to be parsed and published. They are even producing content in a voice that resonates with the content’s specific audience. “Insights from a curious and fertile mind” are missing from computer-generated content. The upside here is crucial: Those who break news may get a few minutes of fame before their stories are recycled by other outlets, but those who produce original research and analysis have material that typically leads to greater recognition and is harder to rip off. Furthermore, a machine can’t report on the aftermath of a devastating hurricane, interview eye witnesses or experts, or live blog a conference (which involves decisions about what is meaningful and what is not meaningful). That takes brains on the ground. One more thing: Machines can’t create a genre or writing style like gonzo journalism. They can only execute within a formula — a formula created by humans. That is, they aren’t creative in the true sense of the word. Which is where we need to focus. As Brian Clark reported in his first episode of Unemployable, the cover of the June 2015 issue of the Harvard Business Review reads “Meet Your New Employee” above a picture of a robot. That’s not meant to be an alarmist headline, even though it’s probably safe to assume many of us feel that machines are getting closer and closer to entering our line of work. This only demands a response, that’s all. The response in “Beyond Automation,” the HBR cover story by Thomas H. Davenport and Julia Kirby, comes in five flavors. The first response from the authors reiterates the conventional answer whenever machines have encroached on human work: get more education. This probably means an MBA or PhD. Or, if you are like most of us around here, simply bootstrap that higher education with books — MOOCs — or by joining a content marketing training and networking community like Authority. More likely, all the above. “There will always be jobs for people who are capable of more big-picture thinking and a higher level of abstraction than computers are,” Davenport and Kirby write. In essence, have computers do the grunt work while you focus on strategy. The second response involves discovering your strengths inside of a field of work, and then enhancing your strengths so much that you eventually master that field and your name becomes synonymous with that field. Think about it. You can’t code a designer’s taste, a writer’s unique voice, or a podcaster’s superb interviewing skills. These are the strengths that make them masters of their disciplines and synonymous with the field. More importantly, you can’t codify soft skills like empathy (that human touch), which is essential to excelling in just about any field of work. So bone up on your emotional and social intelligence. On January 3, 2014, the city of Los Angeles woke up to a magnitude 3.0 earthquake. Within minutes, the story was scooped up and published online by Ken Schwencke. But the article was the work of a machine. Ken is a programmer and journalist at the Los Angeles Times who created an algorithm to help him auto-report and publish stories about earthquakes. In the content creation world, for example, you could use an NLG to create a rough draft, and then edit that draft into shape, adding your unique flair to the finished product. The fourth piece of advice the authors give is to find a niche and burrow deep inside it. But what’s important is that you master a slice of a subject so thin that it just doesn’t make financial sense for anyone to automate that knowledge. And soon enough, your name will become synonymous with that niche. This final piece of advice is simply to “step forward” — become the person who volunteers to create the next generation of the tools that displace certain types of work. Someone has to build the next great automated insurance-underwriting solution. Someone intuits the human need for a better system; someone identifies the part of it that can be codified; someone writes the code; and someone designs the conditions under which it will be applied. And the tasks that have been displaced by the Rainmaker Platform (digital commerce setup, site maintenance, updates) give freelancers and entrepreneurs the freedom to focus on what truly makes them great and drill deep into their subjects, while still having a professional website (and plenty of money left in the bank account). Let me close with this: don’t panic. Machines might take over every single dirty, dangerous, dull, and decision-making task in the world, but you can and will adapt. That’s what makes you a human. And it’s my hope that the five responses I shared in this article give you hope that not only will you survive the robot raid on human careers, but you will thrive. Most of us around here know (if not love) Dave Pell’s Next Draft email newsletter. It’s a slogan I unapologetically adopt as a digital content creator — one who researched no less than 28 different sources while writing this article, vetted the nonessential in favor of the meaningful, and wrote it with sarcasm no machine could match. You, too, can be the algorithm. And together we can take over the world with clear, concise, and compelling content no computer could ever imitate. Who’s in?